This title in the Percy range is designed to further develop children�s counting skills! The fun activities included in the program encourage the user to practice counting in different contexts, including counting on from a number and counting in twos, fives and tens. In addition, the player can practice counting organised and randomly placed objects, as well as being encouraged to sort items before they count. 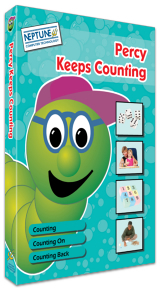 Percy Keeps Counting is supplied with printable worksheets and features 3 levels of difficulty with narrated text. Suitable for unsupervised use, this title also includes an extensive teacher�s section. 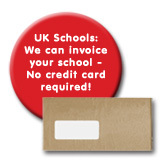 Printable activity sheets and certificate printing facility included. Hosted by Percy the caterpillar, with fun animations at the end of each game. Covers the topics of counting, counting on and counting back. The main menu provides easy access to any of the activities and settings section. This activity requires the player to count the number of animals shown, type in the answer and click on the Check button. 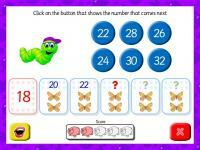 Practise sorting ordering randomly placed buttons before counting them in this counting activity. 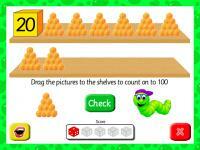 Learn to count in multiples of two, five and ten, whilst helping Percy tidy the shelves! 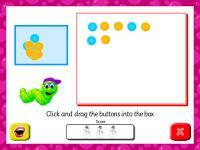 This game enables the player to practise counting on from a number, with the help of a number line. 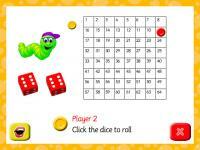 In this activity, the player must count on from a given number and ensure they click the correct answer card. This fun activity for up to four players requires the dice to be rolled and the players' counters to be moved. The first player to the end is the winner! In the settings section, you can change program and game settings, as well as accessing various other features.